Difficult to make anything from that. Can you do two more photos, one dipped, one full beam against a blank wall? If I'm somewhere I can have look at mine I will, but we just had the longest day of the year so it's pretty much light until 1030 at night. Only photo I can find is this one from December 2 years ago. 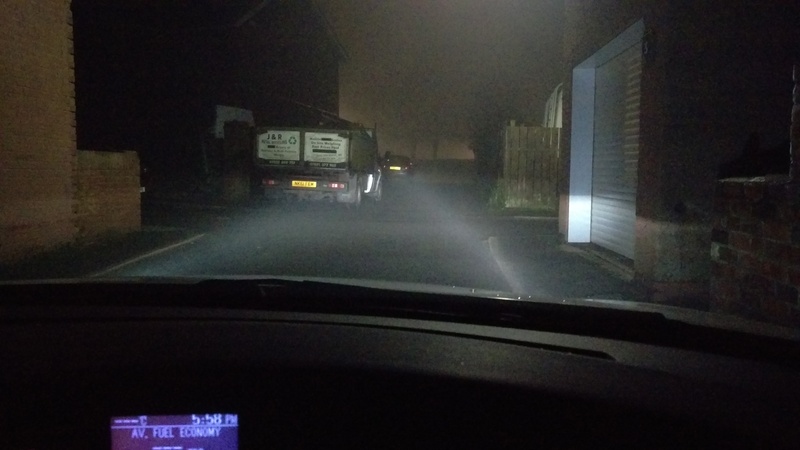 Doesn't appear to show a void in the beam, but the fog could be hiding it a bit. However the steering wheel is on the other side so it may the setup is different although it should just be a mirror image. Out of interest can you see inside the projector when the bulb is out? Could be something like a dead fly. Beam patterns look fine to me. Your dark spots may be caused by this, never noticed before but there's a gap in light produced by both projectors straight down. I'm struggling to see any problem with your light pattern. Perhaps you could mark the problem areas in your photos. 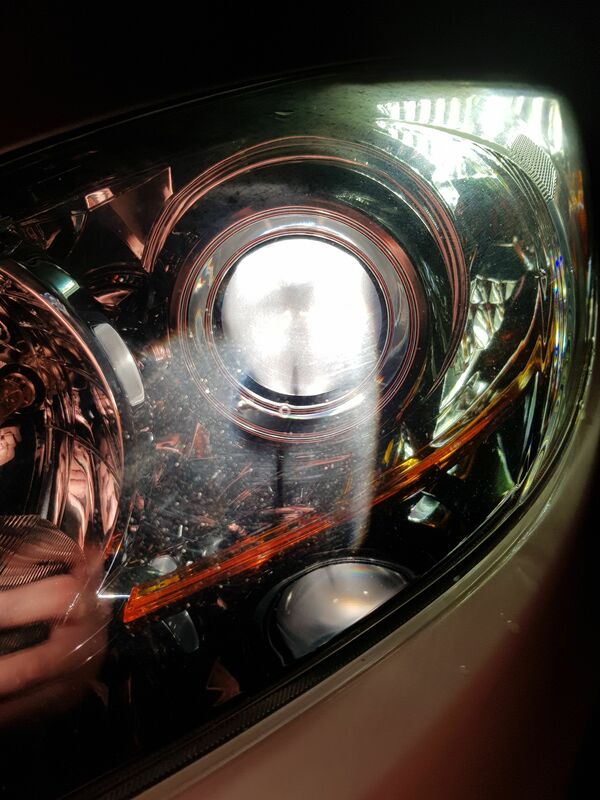 What StevenRB45's referring to shouldn't have an effect on the light pattern. 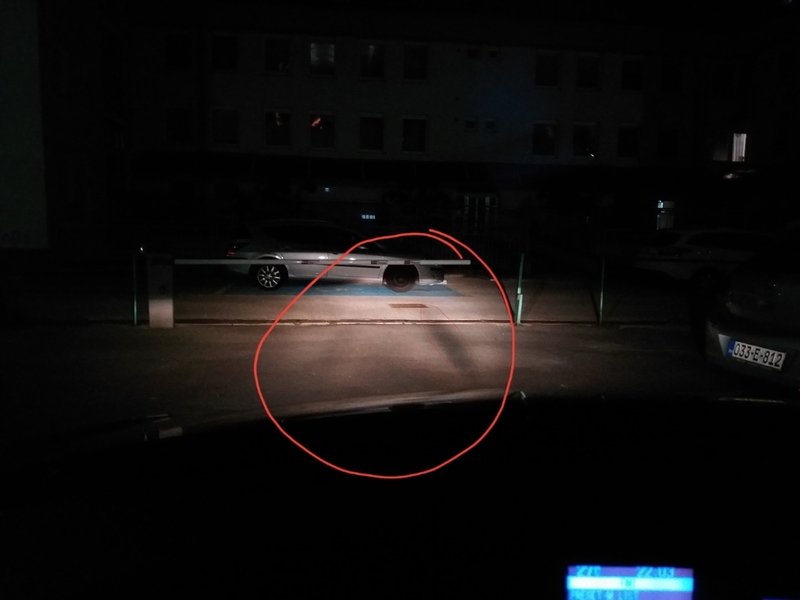 The reflectors effectively spill light round obstructions so the shadows you see looking into the light shouldn't have any effect on the light pattern produced on the road. I think you're looking at this from an mot point of view..from that point of view the lights are fine. I believe what was being referred to was the darker areas I've circled here with my mad paint skills. There's 2 of them which suggests one for each light. Going back to my photo ignore the projector itself look at the light it is throwing onto the outer lens. If you look at the red circle there is a line in the output at the 6 o'clock position. Amars original photo showed this in my opinion but bigger because it's further away from the light source. I'm looking at it for a uniform light output, hence the dipped and full beam images to eliminate any dark areas on the ground/wall. As already stated, there shouldn't be shadow areas projected from the lights. If the two blobs circled are indeed the problems amar's talking about, then the fact that one is significantly darker than the other would suggest something's not right.